AMID the wave of patriotism stirred by the run-up to the 50th anniversary of Singapore's independence - pithily branded "SG50" - is a concurrent wave of reflection on the nation's meteoric journey, coloured by curiosity about what the next 50 years will have in store. Victor Hugo is credited with saying that "40 is the old age of youth; 50 is the youth of old age". As Singapore matures as one of the few existing city-states, taking a closer look at the zeitgeist is useful in drawing lessons from Singapore's past to project the challenges and opportunities in its future. The Singapore government's formula of meritocratic pragmatism arises from the "hard truths" of the country's situation, including its limited land area, diverse population and powerful neighbours. The local popularity of this governing approach was reaffirmed when more than a million people braved sweltering heat and torrential rain to pay their respects to the late Lee Kuan Yew. Since 1976, Singapore's GDP growth has averaged 6.8 per cent per annum, and the country's financial reserves - though they are kept deliberately vague - don't appear to be in danger of drying up soon. Though the country's population has more than doubled from just over two million in 1970 to 5.47 million in 2014, its unemployment is 2 per cent, and the economy is virtually at full employment. Singapore's national well-being is the highest it has been since the global financial downturn: 43 per cent of respondents in 2014 rated their lives highly enough to be considered "thriving", while only one per cent of respondents rated their lives poorly enough to be considered "suffering". This impressive developmental trajectory is hard for a country to top, but many of Singapore's global competitors are cities. Hong Kong has long been seen as a rival for pole position as a financial hub in Asia, and with "megacities" - defined as cities with more than 10 million in population - on the rise, the list of Singapore's potential rivals expands. From 1950 to 1960, 60 per cent of the growth of megacities was in the developing world; between 2000 and 2010, the developing world accounted for 90 per cent. The fastest-growing megacities include two in Singapore's own backyard in South-east Asia: Bangkok in Thailand, and Jakarta in Indonesia. The pace of growth in these megacities intensifies competition for many of the elements that Singapore has relied on to grow - and most worrying is the competition for talent. Singapore has long aimed to be the "home for talent" in Asia. In 1970, 97 per cent of its population were residents; in 2014, just over 70 per cent were. Much of the influx in non-residents was driven by foreign talent, or expatriates with experience or expertise lacking by locals. Now, as domestic political pressure mounts against further population growth while existing infrastructure cannot accommodate the pace of population expansion, other growing megacities seem more attractive as alternatives to Singapore. Because of these factors, recruiting a steady supply of foreign talent may no longer be a sustainable strategy to meet Singapore's talent needs. In the growing technology sector, for example, a recent report ranked Singapore last among 20 startup-friendly cities for access to talent, taking 21 per cent longer to hire a software engineer than in Silicon Valley. Singapore also ranked as the most expensive city in the world for the second year running, so even with its relatively low personal income tax rates, employment in the country may not be as enticing as it used to be for foreigners. In the short and medium run, Singapore must improve the political feasibility of importing foreign talent, attract and retain the right talent, and enhance the productivity of the talent it has to stay ahead of its competitor megacities. Reversing a long-term decline in labour productivity will require exploring new solutions. Though productivity grew at an annual rate of 5.2 per cent in the 1980s, this figure fell to 1.8 per cent in the 2000s. The quality of the country's resident labour pool is very high; the literacy rate among residents is a 96.7 per cent, while almost 26 per cent of residents 25 years and older are university graduates. But ensuring that labour pool is productive may be a challenge. 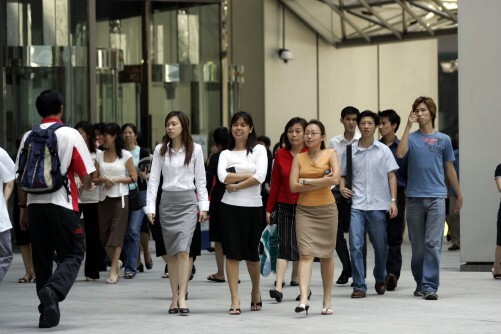 According to Gallup's 2013 State of the Global Workplace study, only 9 per cent of Singapore's workforce can be considered engaged, while 91 per cent are emotionally disconnected from their workplaces and less likely to be productive. Gallup researchers have conducted eight meta-analytic studies over 15 years, and each time have observed a strong relationship between employee engagement and productivity. In the most recent study, workgroups with high levels of engagement are 21 per cent more productive than workgroups with low levels of engagement. Gallup studies also suggest that only three in 10 people have the naturally recurring thought patterns to manage people for performance excellence, giving them access to that increase in productivity. Choosing the right people to be managers and leaders and investing in the development they need to excel may hold the key to unlocking the national push to productivity. Small and medium-sized enterprises employ about 70 per cent of Singapore's workforce, so finding and deploying a scalable and cost-effective solution to help them select, engage and develop high-performing talent may be a useful first step in helping the country improve its competitive position in the global war for talent while improving the productivity of the talent it already has. A growing body of research suggests that optimising the workplace yields strong productivity gains at a high return on investment. Engaged employees make up only 9 per cent of the workforce, so increasing this percentage could offer at least as high a return on investment as a technological or process improvement. In the youth of Singapore's old age, the country celebrates its first 50 years of success as a nation. If it harnesses the potential of its people, just imagine what could be in store for the next 50.